ASTORIA — Get ready for a culinary tour de Queens. Meg Cotner, a writer for popular neighborhood blogs We Heart Astoria and Queens NYC, spent three months eating her way around the borough, sampling eats from nearly every neighborhood and picking her favorites. The results of her search can be found in "Food Lover's Guide to Queens," a 400-page handbook published last week that offers a culinary roadmap of the best restaurants, food markets and street carts that Queens has to offer. "Queens is so robust with its food," said Cotner, 44, a California native who moved to the city to study music. "I think it has incredible variety. It has something for everyone." Cotner, who settled in Astoria in 2005, spent most of last spring traversing the borough on foot and by train, checking out shops and restaurants that came highly recommended, and stumbling upon others she'd never known about before. "I ditched my fear of any B-rated restaurant," she said. The Queens food scene offers an ethnic and cultural variety that sets it apart from the rest of the city, she says. "This is an immigrant borough and there's a lot of first generation [people], so the connection to the food from where they came from is really strong. It’s not diluted," she said. "I got to try a lot of things that people in Colombia would eat for breakfast, or what people would eat in Italy or El Salvador." In Astoria, Cotner recommends Il Bambino on 31st Avenue, which serves artfully pressed Italian paninis and Spanish-style small plates. Her other local picks include brunch at Stove on 28th Avenue, the pies at Astoria Boulevard's Basil Brick Oven Pizza and Bosnian dishes at Cevabdzinica Sarajevo on 34th Avenue. "I love to get the little sausages and ćevapi there, and their bread is really good," she said. Other highlights from her journey included the days spent sampling the many food trucks along Roosevelt Avenue in Jackson Heights, steamed beef buns in Flushing and an array of Caribbean and Southeast Asian eats in Richmond Hill, including Surinamese joint Warong Kario on Liberty Avenue. "Woodhaven was an interesting discovery for me," Cotner said, adding that her favorites there include the Filipino food at Mama Meena's on Jamaica Avenue, and Schmidt's Candy, which has been selling hand-dipped chocolates and other goodies since 1925. Don't miss the salteñas — "the Bolivian answer to empanadas" — at Woodside's Mi Bolivia on 48th Avenue, Cotner says, and for any variety of Asian food, just head to Elmhurst, known as one of the city's "Little Chinatowns." "You can go get Thai food, you can go get Taiwanese food, there's a Fay-Da bakery there," she said. "A whole variety of places." One of her the most interesting discoveries, she said, was Lhasa Fast Food in Jackson Heights, where she found some of the best momos — Asian-style dumplings — in an unlikely space: a food stall hidden in the back of a cell phone store on 74th Street, past racks of incense and DVDs. "It's like going into Narnia," she said. "I really enjoyed the momos there. They were really juicy and their spicy sauce seemed to have more vinegar in it than a lot of the others, which I really liked." Cotner, who manages the Hellgate CSA and has a passion for traditional foods like grass-fed dairy and pastured eggs, said her research for the book meant a few months deviating from her regular eating habits, though she says she didn't mind the change. 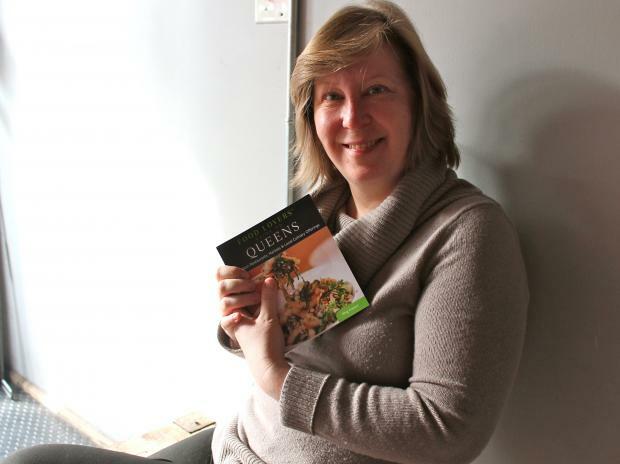 "I was more concerned about getting to know Queens through its food," she said. And though she's back to home-cooked meals now that the book is published, Cotner says she never really tired of dining out. "I thought that by the end I’d be like, stick a fork in me," she laughed. "But I think it might have been a week later I was ready to go again."